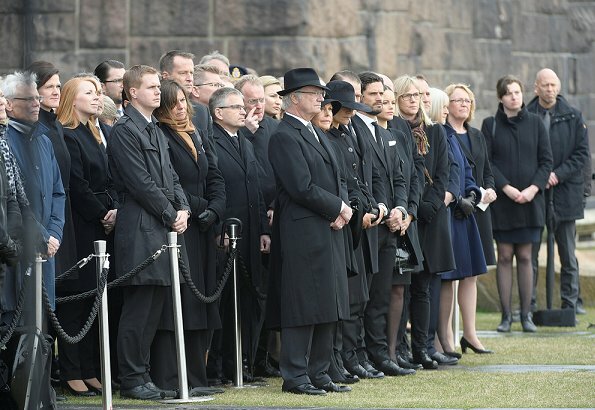 The Swedish Royal Family, King Carl Gustaf, Queen Silvia, Crown Princess Victoria, Prince Daniel, Prince Carl Philip and Princess Sofia attend an official ceremony and a minute of silence to commemorate the victims of Friday's terror attack on Drottninggatan. 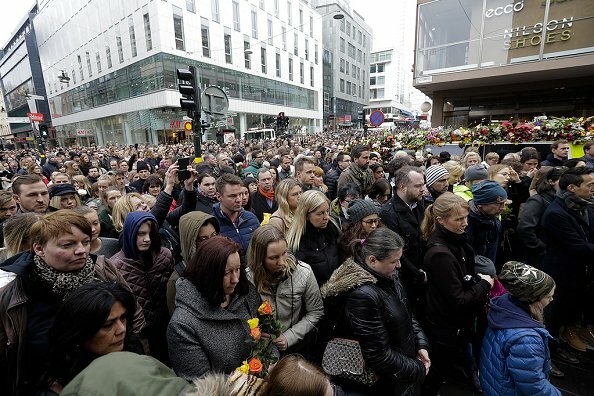 Four people died and fifteen were injured when a truck plunged into a crowd at a busy pedestrian street in the Swedish capital on April 7, 2017. 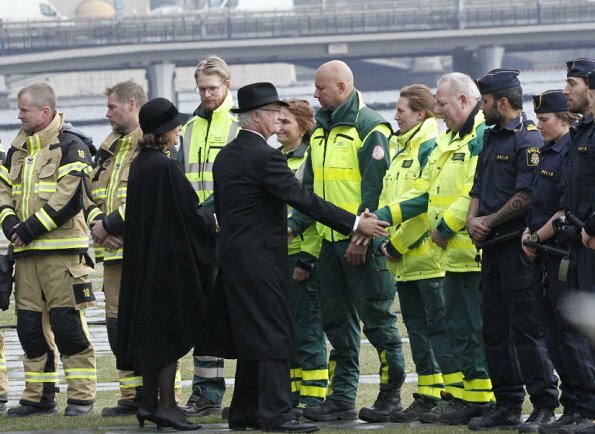 I think it's amazing the way the Swedish Royal family have supported their country. Such a sad and devastating attack on innocent lives. But honestly I'm seriously disappointed in Madeleine. She has no problem whatsoever showing up when there's a fancy tiara wearing ballroom gown event. She couldn't even be bothered to show up on such a somber and serious occasion. She is a princess of Sweden, and to me that means more than just wearing a tiara. But supporting your country in both good and bad times. She posted on her Facebook that she held a minute silence at home, but how hard would it have been for her to get on a plane and be there with her family. I can honestly see why she gets so much criticism. Ich denke, sie wird ihre guten Gründe dafür gehabt haben, nicht nach Stockholm zu fliegen. Bevor sie irgendetwas anderes ist, ist Madeleine Mutter von zwei sehr kleinen Kindern, die sie weitestgehend ohne Hilfe von außen gemeinsam mit ihrem Mann erzieht und wir können von hier aus doch gar nicht beurteilen, ob das jetzt der richtige Zeitpunkt gewesen wäre, Leonore und Nicolas alleine in London zu lassen !? Vielleicht ist Chris auch gerade nicht da - das alles wissen wir doch gar nicht !! Und:Im Gegensatz zu ihren Geschwistern bekommt Madeleine, seit sie verheiratet ist, keine Apanage mehr! Sie ist zwar immer noch logischerweise Mitglied ihrer Familie, steht aber nicht mehr im Dienste der schwedischen Krone, es gibt also überhaupt keinen Grund, weshalb sie sich jetzt da irgendwie "verbiegen" sollte, um eine Reise anzutreten, die jetzt gerade vielleicht einfach nicht in den zeitlichen Rahmen ihrer Ehe / Mutterachaft paßt. Die Schweden sollten langsam verstehen, daß Madeleine in erster Linie Privatperson ist und auch ein solches Leben lebt. Wenn sie hin und wieder zu bestimmten Anlässen öffentlich auftritt, tut sie das wohl hauptsächlich ihren Eltern zuliebe, aber nicht, weil sie noch irgendwelche Verpflichtungen hätte. Der schwedische Staat muß für Madeleine nichts bezahlen, solange sie sich ins Privatleben zurückzieht, deshalb steht es auch Niemandem zu, sie zu kritisieren. A familia real apoiar o pais não tem nada demais. É claro que apóiam. Qual monarquia não o faria. Todo o mundo apoia. E ainda bem. No que toca a Madeleine concordo. É especialmente nestes dias que se deve estar presente. Bine, please don't use the excuse that Madeleine has 2 small children to take care of. She has 2 nannies, seen them both in paparazzi photos of Madeleine prancing around London. Also don't use Chris as an excuse either, Chris was recently seen alone without his family in Stockholm on a business trip, and Madeleine herself said Chris is away a lot working. She has no excuse, London to Stockholm is a few hours via a plane, and she can surely afford a private one. I also don't believe that Madeleine receives no money from the Swedish appanage, the court claims this but there's actually no proof to back it up. If the Swedish people should understand that Madeleine is a private citizen or whatever you said then she needs to give up her title. She can't have it both ways. Her part time princess act is wearing thin. I don't know if you've been living under a rock, but Madeleine is highly criticized in Sweden. Frankly people are getting fed up of her and her snobby attitude and only showing up when it suits her. Die einzigen die eine Apanage bekommen sind das Königspaar wie auch das Kronprinsessinnenpaar. Selbst Prins Carl-Philipp und Prinsessin Sofia bekommen keine Apanage. Madeleine will die Vorzüge einer Prinzessin aber nicht die Pflichten. Und sie hat ne Nanny und Chris Mutter. Also nicht wirklich allein. Für New York hat sie komischerweise immer Zeit und Stockholm bist du in einer Stunde. Vormittags hin - Nachmittags zurück. Just adding my opinion here and I do agree that it looks bad that Madeleine didn't attend. I understand that she is the youngest and married to someone who turned down a title, but she needs to remember that she still has one herself. I really think that Madeleine should give up her title because what use is it to her except that she gets to see pretty dresses and tiaras. I honestly think the reason she doesn't is because she likes to play dress up princess and wouldn't be able to that anymore. She claimed in that interview she and Chris did that she would be working to represent Sweden in London but she hasn't. She opened up a children's library and that's all. There really isn't an excuse for her not being there, her children have nannies. Chris I mean I don't even know what he really does for work. Also with her only receiving money when she officially representing the SRF, she makes for she gets as much as she can. Her clothes are very expensive. Honestly Madeleine is my least favorite member of the SRF. She seems to be very stuck up and snobby. There's something so off putting about her and her husband. 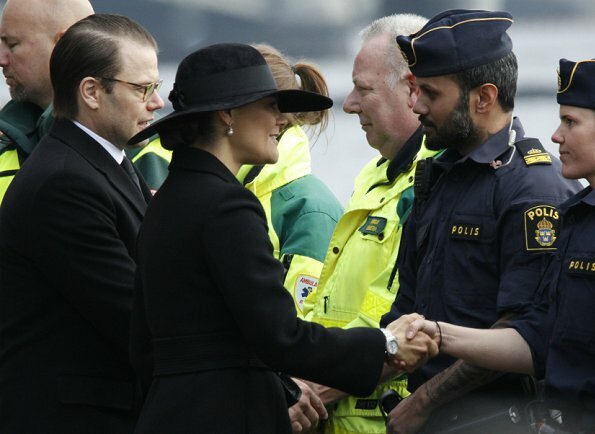 Its really sad that Princess Madeleine has so few work events. I'm afraid there's no hope that the situation will change anytime soon. I'd say that it has become even more difficult because whenever some royal has solo work event, its necessary to provide the security and safety for everyone attending, and it would cost a lot, so they've limited work between the King and Crown Princess couple. Haven't you noticed that Sofia and Carl Philip also rarely get solo events? Or Madeleine mostly attends when there are more royals present? BTW: Black is not good color for Princess Sofia, not only on clothes but also as her hair color (it makes her look decades older and don't think its something woman want ;) ). No one is criticising her at all. Look into her facebook, her people, her own Swedish people supports her and her family. A lot of them love her and her family. People in Sweden know that their Princess does not want to be a Princess but her parents stop her, they have a hard time making her change her mind. This was even reported about 6 years ago. BTW, she only has 1 nanny. I do not think this is an excuse at all, her family may think its wise and advisable for her to stay in London right now when things are still kind of upset and crazy in Stockholm. Who knows what's going to happen next? Anymore terrorist attacks going to happen? There's nothing wrong of her if she wants to stay with her children although she has a nanny. Yes Chris is working and he maybe out of town, its best to have her at home with the kids. We must not forget London suffered the same terrorist attack at Westminster Abbey recently, from my point of view, she staying back in London is a wise decision. Did anyone in Sweden observe 1 minute of silence for the people in London? I did and all my thoughts are with all these people who have been badly affected, the victims and their families. I just want to say to Princess Madeleine, give lots of hugs to Leonore and Nicolas, stay with them at this incredibly sad moment. Lim Ling: I am Swedish and I know for a fact that she is highly criticized. Just because she gets positive comments from people who like and willingly follow on her Facebook means nothing. She is the least liked member of the Swedish royals. Even Sofia is liked more than her now. Karl K: I don't think the reason for them having fewer and joint engagements is because of security costs and concerns. But it's just that they aren't really needed anymore. Except for the Nobel prize ceremonies, and a few other engagements. 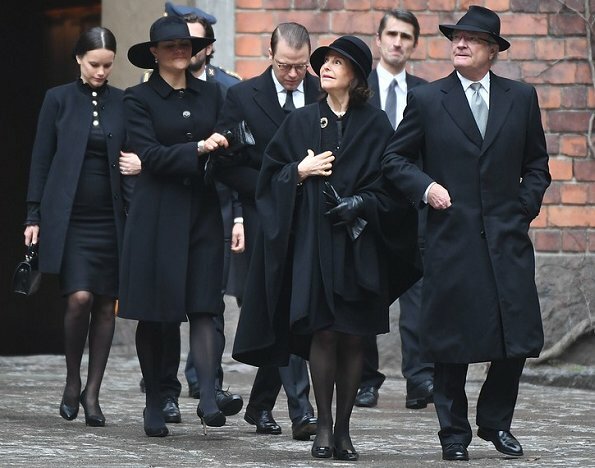 A few members of parliament even tried to cut appanage for Carl Philip, Sofia, Madeleine and their children because they said that it was not a point to be paying so many royals and there was not much to be done. Similar to what happened with the Denmark royal family. They only wwanted to keep supporting the king and queen, Victoria and her family. I love the royals but I do think that by the time Victoria's daughter Estelle is an adult, there will no longer be a royal family. Bine, das ist jetzt nicht Ihr Ernst, oder? Anonymous seems to be really pissed off by Princess Madeleine 😜 Madeleine should give up her title? Has she done something inappropriate, criminal, improper to warrant this kind of drastic measures? She's the king's daughter. Nothing changes that. Once Victoria will be the queen, things will probably change. But in the mean time Madeleine works as much as she's given official duties. And its quite interesting that people only expected Madeleine to give up her title. Not Carl Philip, nor Sofia. As to Madeleine getting money from appanage: its been said more than once that she only gets money when she works. Do you say they tell lies? I'm sure the press would soon find out if it were the case! Marianne, this is an official ceremony for the victims of the terror-attack and the only ones who do not take part are Madeline and Chris. Carl Philip and Sofia are there. I can understand the demand that Madeline should not have her title any longer. She does not show respect for the people having been killed nor for their relatives. We should get back to talk about fashion. But I just want to add that whatever Madeleine does and says is wrong, whatever her husband says and does is wrong. Madeleine and Chris are bad and everyone in this family is a saint. BTW, I am not so sure that people like Sofia more than Madeleine. People will still criticise her if she comes back for an hour of ceremony. Her transport to and fro and security cost money, people will still go after her, isn't it? Well, its true monarchies are irrelevant and out-of-date now...maybe its time for a change. Back to fashion and everyone stay safe. Coralie, are you serious? Madeleine should give up her title because she missed the ceremony??? Sorry but this sounds just ridiculous, stupid and over the top! And as Chris is a working man, then he can not drop everything at a moment's notice. Besides we do not know real reasons why Madeleine did not travel from London to Sweden to attend the ceremony on Monday. Security risks? They wanted at least one grown-up member of the SRF to be away from there just in case. But one thing is clear: Madeleine was deeply concerned by what happened in Sweden. She clearly showed her concern, held a minute of silence in honor of the victims. Not sure if all Swedes did that. Agree with Lim Ling and Marianne. People have double standards. Madeleine was not the only one to enter into non-royal marriage but somehow she's the one who should give up her title. Didn't hear them demanding that Carl Philip should give up his title because he married Sofia Hellqvist. And its the saddest that people do not hesitate to bash Madeleine and Chris even after this sad event. They could/did not attend. Period. But to insist that she should give up her title...preposterous. Personally I like Princess Madeleine and her fashion choices. She's very elegant and beautiful woman who attracts lots of attention to the royal family (just like her sister). I know many people who have started to follow the royal family all because of Madeleine. So she has done something good at least (or should we blame her parent's genes, after all, she can not do anything right in some people's opinion). Lets not forget that this is a fashion site and not a good place to say whether Madeleine should give up her title or not. But if you suggest something like that, then please give better reasoning why she should do so. Personally I find the way princess Sofia was all smiles when royals arrived there more disturbing than princess Madeleine's absence. At least Madeleine's dignified post about minute of silence sounded more sincere and genuine! There is indeed double standards. Evelyn, SO right. I also found a bit disturbing Sofia smiling and good modo caught on camera. Gerade mal 4 Wochen ist es her, dass ich mich genau in diesem Bereich von Stockholm aufgehalten habe. Wie schön für die Schweden, dass ihre königliche Familie mit ihnen trauert. Ich glaube, in solchen Momenten zeigt sich, dass Königshäuser und ihre Mitglieder nicht nur für hübsche Modefotos sorgen, sondern mit ihrer offen gezeigten Anteilnahme das Volk dabei unterstützen, die schwere Zeit besser durchzustehen. I cannot help but feel that this gets blown out of proportion somehow. If the public, and the royal family for that matter, feel equally strongly about the attacks, assaults and injuries that occur almost on a daily basis in Sweden, I would understand. But since no-one seems to care normally, I find this overly dramatic grief very staged and rather hypocritical. I was thinking that. In videos ans photos one time they are sooo sad, which is normal, another seemed to be quite OK. I feel like they are sad, of course, but they seem to exagerate. Seems like a very close relative died unexpectally. I would say that the difference between this attack and other crimes that happen in Sweden, is that this one has a political/"religious" agenda and was an attack aimed at the society as a whole without personal connection to the victims. That is why it is important to manifest that Swedes stand United and will not succumb to such terror. It's not exaggerated. Sweden views itself as a safe and fair country and want to and will continue to be so. It was sad event and not something you'd expect to happen. But Vanessa, you have a point! Sweden is no longer the same safe country it used to be like 10 years or even 5 years ago. There are attacks, assult and injuries almost on a daily basis. Local police says that they are overwhelmed by migrant crime, gangs.... But when you look at the royal family, then its like they've discovered only now that there's something bad happening in their country and they react belatedly.